Opito Bay is real hidden gem in the Coromandel. It features a beautiful sandy beach with safe swimming, great fishing and diving. From our house you can watch the kids swimming or dolphins playing while making dinner from the kitchen or relaxing on the front deck. This beautiful holiday home is conveniently situated just up from the boat ramp and has spectacular panoramic views of the bay and Mercury Islands. This two story holiday home features an open plan kitchen, dining and lounge area and opens front and back onto decks. There are two upstairs bedrooms. One contains a king-size bed and its own toilet. There is room for a cot in this room if required; and there is a porta cot available. The other bedroom sleeps four and contains a queen size bed and a bunk bed with two king singles. The downstairs bedroom sleeps 4 and contains a Queen size bed and one bunk bed with two singles. Also located downstairs is the laundry, a separate toilet, bathroom with a bath and a separate shower room. There is a large front lawn for parking cars and boats and the beach is just a few meters across the road. Front and back decks to really chill out. Had a great time in Opito Bay. Nice house, amazing outlook, good weather what more does one need. Would have loved to stay longer. We loved our stay, it was a wonderful escape. The house was clean and very well appointed, we had everything we needed and enough space for all of us. The views from the house are amazing, it is right on the beach and stunning. Opito Bay is gorgeous, the beach was lovely and the water crystal clear. We thoroughly enjoyed our week and would highly recommend the house, we will be back! Lovely views from the second story, which is all we ended up using. 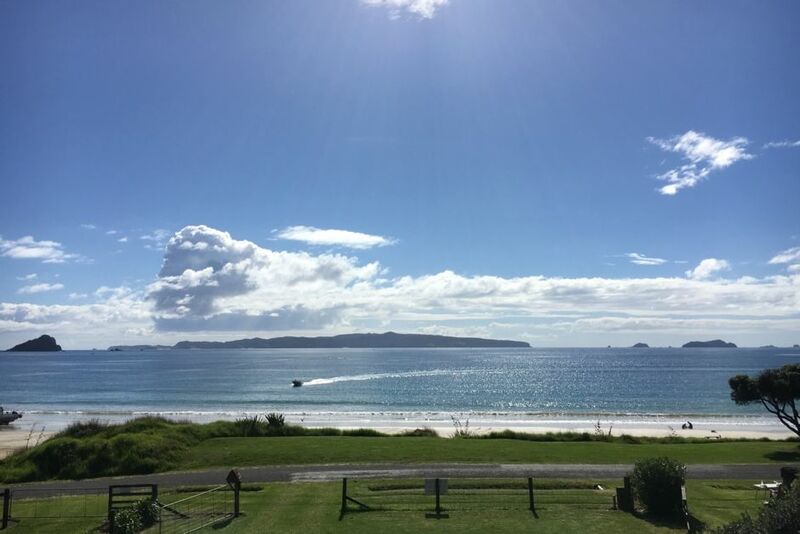 This bach is just lovely, right on the beach, had everything we needed, and was very safe for our toddlers and newborn (we really appreciated having the high chair, baby gate and portacot!). The rooms are spacious and bright, comfy beds, and the kitchen is very well stocked with everything we needed and then some. We had a wonderful stay here and hope to come back soon!